Kohlrabi is a new ingredient for me, as it is for many people I have spoken to recently. It turns out, this vegetable has a crisp, crunchy texture which is perfect for salads. 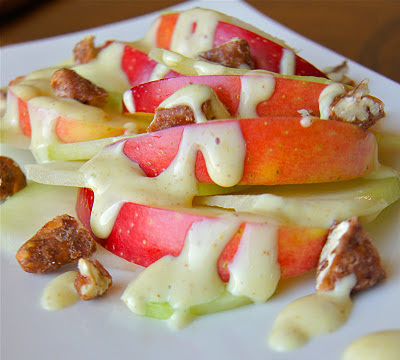 As a matter of fact, the salad that follows is a crunchy salad in general, with crisp apples, and candied pecans that requires a smooth, contrasting dressing. Combine the kohlrabi, apples, and the dressing. Toss well to combine. Top with candied pecans to serve. Yummy, will surely try it this weekend. I tried this receipe this sunday, and i must say that it was so yummy. Simply awesome receipe, very yummy. Very nice - though perhaps I'm being picky but I did feel it was missing a variety of textures - it was very crunchy but I like variation. Everyone else in the household adored it! It was one of the best reciepe of yours. All my friends loved it so much. Hi Natasha, found your blog through Lazaro Cooks! Love what you're cooking. Your kohlrabi salad looks divine!